Hwaseong Fortress is a highlight in 18th century military architecture, combining features from East and West. This fortress in the city of Suwon was established in September 1796. The Emperor Chongjo moved his seat of government to Mount Paldal in Suwon, and he encircled it with strong defensive works laid out according to the precepts of an influential military architect of the period, who brought together the latest developments in the field from both east and west. The site consists of 48 monuments in total: the massive walls, four gates, bastions, artillery towers, and more. It partly was burnt down during the Japanese colonial period and the Korean War, but renovation works in the 1970s restored it to its former glory. The fortress is still quite intact: a lot of different towers, four gates and the city wall can be seen today. The best thing to do is walk the city walls - then you pass all sights. This tour is about 5.5 kilometers long, but will take you an hour or two because of the steep climbs involved. Because of the burning heat at the day I visited the site, I did only half of the tour. Still worthwhile though: as most of the monuments I visited in Korea it is renovated very well. I visited here in late 2007. Suwon is about an hour ride by commuter train from Seoul. When I arrived in Suwon I walked to the Hwaseong Fortress, getting lost on the way in the cold weather. When I got to the castle I just walked up the first stairs I found along the wall of the castle. When I got to the top I saw a bunch of guys standing around in traditional dress. I figured that because it was a historical site, they must be doing some re-enactment for school kids or something. Hwaseong FortressSaveWhen I get to the top of the hill, I find a ton of people, cameras, lights and big cranes. They were shooting a movie! Me, some dopey white guy with a camera, comes over the top of the hill where no one was stationed because they didn’t think anyone would be walking around the part of the grounds. Had I been there a minute or two sooner, I would have walked right into the middle of their shot. I stuck around for about an hour watching everyone do their thing. I had never been on a movie set before, so I found that much more interesting than the historical relics around me. The director looked like a Korean hippie. I have photos of him and the lead actor, but I have no idea who they are. Read more about the Hwaseong Fortress on my website. I visited this WHS in May 2017. It is definitely one of the best day trips from Seoul and one of the most impressive fortresses in South Korea, not only for its size and condition but also for the different military constructions and defense structures. Being Spring meant that admission was once again free of charge. From the subway station in Suwon, we caught a standard taxi to Paldalmun Gate (bottom left photo), one of the 4 main gates of Hwaseong Fortress completed in 1795. 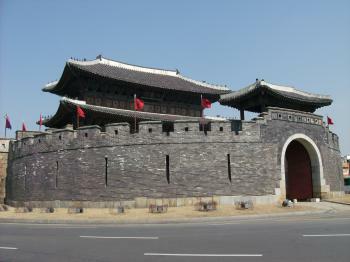 It is one of 2 gates with a semicircular reinforced defense wall, quite similar to the Heunginjinmun Gate in Seoul. The only pity is that it is used as a very busy roundabout. There are several coffee shops with terraces for good photo opportunities. Paldalmun Gate was our starting point to cover the whole 5.74km circuit on the fortress walls, stopping at intervals to take pictures and to explore the many exits which led to other paths beneath the walls or to other defense structures. We headed straight uphill for what was to be the longest stretch uphill of the whole circuit. After that it is a very pleasant walk with several panoramic viewpoints. There are 2 UNESCO WHS stone markers, just a bit further on after you climb from Paldalmun Gate, and another next to Hwaseomun Gate, where locals and tourists, young and old, enjoy kite running and archery. A section of the stone wall on the left of the Hwaseomun Gate contains the names of all those involved in its construction. There were long stretches of the fortress walls where we were alone except for some black squirrels and passerine birds. My favourite defense structures apart from the gates, were Seonbukgongsimdon (Northwestern Watchtower - bottom right photo), the 7-arched Hwahongmun Flood Gate (top left photo) and the unique Bongdon Beacon Mound (top right photo) with 5 signal chimneys used in combination to send different messages. 1 was lit in normal times, the second was lit when the enemy was spotted close to the national border, the third was lit when the enemy reached the border, the fourth was lit when the enemy crossed the border and the fifth one was lit when fighting took place. it was very hor but wind blew so it wasn't that hot. I ran to the school to be in time. and I got in to the bus with relief.When I seated my self at the bus seat, my heart was throbbing with the anticipation. Speaking and laughing with my next seat's friend, we were in Suwon. We entered the Hwasong castle. Everything that we learned at school was right in front of my eyes. it was superb. 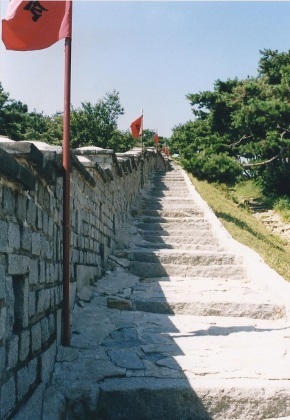 the single path of Hwasong castle, a small pattern that was used...were all specially designed for the king. Knowing about the small and big part of hwasongcastle, it looked different. They really cared a lot for the king! I loved the beauty of the cool wooden floors. We saw Dwiju, where Jongjo's father died, I got in there my self and it was just a very small box. staying there not provided food and water, for days.... it was horrible and I felt sorry for him. Then we departed to the hwasong museum. We could see the real sized geozunggi and other devices which were used when building the È­¼º. Old people were much more smarter and scientific than I ever thought. Really Jong yakyong was amazing scientist, not only a scientist but also, a poet, mathematician, technician, scholar and author. I want to be like him because he was good at everything. I think we need to be like him to make the future better. After we visited the museum, we took rest at the Á¤ÀÚ next to the Suwon river. It was cool because of the wind of cold Suwon river and the shde. It was like Korean heaven.What amazed me was that this Á¤ÀÚ existed for a long long time.My ancestors could enjoy this happiness. We took some nap hearing the sound of the river. When we woke up, the experiment was ready, the experiment of measuring the quality of the water of Suwon river. We performed the experiment successfully. And what we found out was that the water was extremely clean and pure. Then we went to where our teacher was. It was for viewing far ton protect the castle. Therefore, a few walls were there. There we made sloguns for Suwon, I was sure that our creation was much better than the previous Suwon's slogun 'HAPPY SUWON'. Then we went to the English zone and checked what we learned with English. It was such a fabulous trip. And I think it's a good form of learning. Hwasong is amazing and I want to visit here again. In summuer vacation,I visited Hwaseong for school program. Though I live nearby Suwon, it was first visiting to Hwaseong. The history of Hwaseong was very interesting to me. Suwon Hwaseong Fortress was constructed by king Jeongjo, the 22nd king of Joseon dynasty after moving the tomb of his father Sadoseja, Crown Prince. There were multiple reasons for constructing the Suwon Hwaseong Fortress. 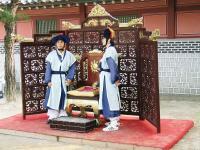 The most important reason was King Jeongjo's filial piety to his father. But, there were other reasons : his political strategy to eradicate faction struggles and establish the king-led politics; use of it as fortress of national defense to the south. One of the most memorable places was Hwahongmun. Hwahongmun, otherwise known as Buksumun, is the gate under which the Suwoncheon flows on entering the area encompassed by Hwaseong. (It formerly exited through Namsumun, but this gate no longer exists.) The gate has the obvious function of being a bridge, but also housed cannons for defensive purposes. Especially, I analyzed water in Suwoncheon, and as a result it was very clean. My first visit to Suwon was absolutely unforgettable and precious memory. Suwon Hwaseong Fortress, constructed by king Jeongio in 1796, is not only a result of filial piety of king Jeongio to his father, but also a combination of technology and nature. Although Suwon Hwaseong is a famous korean heritage and also one of the UNESCO's world heritage, I have never been to Suwon Hwaseong before. Fortunately, I had a chance to visit Hwaseong as a part of school program. While looking around, I was soon intrigued by the fascinating scenery and historical significance of Hwaseong. Among many things, what impressed me most was the King Jeongio's caring mind for the people. 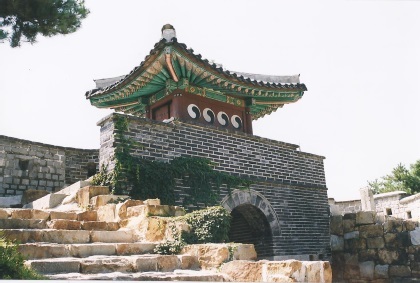 It is said that king jeongio cared a lot for the workers constructing Hwaseong. He gave cold water in summer and blankets to cover in winter. For the King's caring mind and specially invented machines, such as geojunggi and nokro, which were used to carry big stones - Hwaseong was completed seven years ahead of time what was planned originally! please visit Hwaseong, and learn more about it while enjoing beautiful scenery!! I visited Hwaseong Fortress by field trip in afterschool class. We¡¯re looking for Hwaseong¡¯s beauty, historical importance, construction management and else. While I walk around Haenggung, I can see the King JeongJo¡¯s filial piety to his father, Sadoseja. Also, I can feel the JeongJo¡¯s love for the people. At Changryongmun, there is the plate where the people¡¯s names are written. Jeongjo wants to pay the labor of people. In December 1997, Hwaseong Fortress was registered as UNESCO world heritage site. People around the world have known the significance of Hwaseong since then. And I can feel the foreigner¡¯s love for Hwaseong. There are many tourists from other countries who are touring the fortress as listening to the tour guide. Especially, there are a lot of Japanese and Chinese. 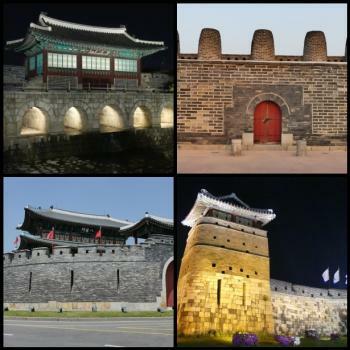 As Hwaseong Fortress is made for defense, there are many interesting traits on fortress walls. For example, there are small holes on the walls for archery. And ongseong of East and West gate are round shape to defend the enemy. When I visited Hwaseong Fortress, I was surprised to see other buildings around the fortress. Actually, when built, the fortress was designed with combining features of military architecture and habitable area. Also, it is not only scientific, but also beautiful. For example, when it was built, a lot of latest machines were used. A scientist Jeong Yagyong made plenty of machines including cable driving system. Also, the fortress has aesthetic features. Banghwasuryujeong is the most beatiful place in Hwaseong Fortress. Around the place is fantastic nature, including a pond, trees and hills. There is one famous story about Banghwasuryujeong. When the the king Jeongjo drank alcohol with his courtier, he said "There is 8 moons around here. First one is on the sky. Second one is in the pond. Third and Fourth ones are in our eyes. Fifth and sixth ones are in our glass. And, seventh and eighth ones are in our heart." When jeongjo built the fortress, he thought a lot about his subjects. So he did not force them to work. Instead, he hired them. He gave enough salary to them. And also in the Changnyongmoon, the east gate, he ordered them to carve their name on there. Hwaseong Fortress is a place of science, beauty and warm-heart. No one would regret visiting there. I recommend anyone visit there. I have often been to Suwon, but I've never been to Hwaseong before. I regret not visiting it beforehand. My school's program, Steam project brought me there. We arrived at north gate (Janganmun). Janganmun is the biggest door in Hwaseong because it is the first gate which king from seoul met at first. It is absolutely sad that the walls by Janganmun were destroyed because of road making. Hwaseong was built for military stronghold. so there are many military facility such as north-east gate guard platform, north-east turret, and north-east guntower. Among lots of Hwaseong facilities, Hwahongmun has the most beautiful scenary. 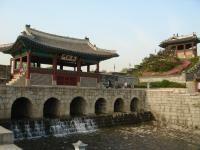 it is the gate under which the Suwoncheon flows on entering the area encompassed by Hwaseong. it also makes great harmony between colorful bridge and water. North secret gate is special because it is the only remaining secret gate of the three originals. we can see the building only in front of it. I thought our ancestor's wisdom was really great. At night, there are a lot of lights making wonderful scene. so I recommend visiting it not only daylight but also nighttime. 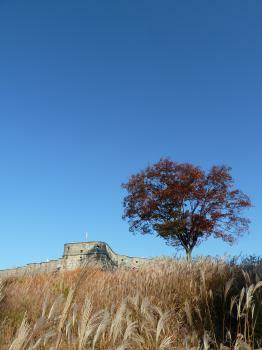 Certainly, nobody would regret visiting Hwaseong Fortress. Although I live in South Korea, I have never been here. What brought me here was a new school program. It dealt with the theme – Jeong Yag-yong and Hwaseong Fortress and one of the schedules was actually visiting here. There were lots of special buildings and doors. I was especially interested in secret gates. Those gates were tiny and had to be only pulled to open. If the opponents noticed that they were doors, people in Hwaseong Fortress would fill up the space behind the doors with mud and rocks. The use and appearance were all interesting. 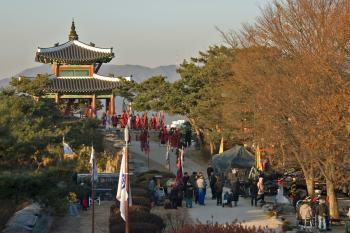 The place I liked most was East-North Pavilion, which is also called Banghwasuryujeong. It was nice and cool unlike the steaming weather and the sight was beautiful. Hwaseong Hanggoong, the place which was built for the King was beautiful but little bit awkward because it was rebuilt after damages. One of its buildings, Naknamheon was the only building kept from damage and remained without rebuilding. Maybe that's why it looked outstandingly elaborate. Martial arts performance before entering Hwaseong Hanggoong was also great. I absolutely recommend Hwaseong Fortress to everybody reading my review. The Hwaseong Fortress, located in Suwon, 30km from Seoul, is an ancient edifice built at the end of the 18th century to prevent the kingdom from its numerous enemies. It uses elements from both occidental and oriental architectures. That makes this building unique compared to any other Korean fortifications. Today, you can visit the fortress for free, walking over the walls, from one guard tower to another and passing by the four gates of the complex. To get to the wall, you firstly must climb the hill but this worth it. You will enjoy a great view over the city and above all, you will discover walk by walk the architecture of this fortress and the different places of importance. Thiz site is for my part one of the better WHS in South Korea. Sometimes things just come together to make a visit a little more enjoyable. That was the case with my visit to Suwon to see this fortification. I had already had an interesting morning trip to crazy world of the DMZ, so used the hour long metro ride south to recharge my batteries and admire the stunning clear crisp autumn day shining on the endless suburbs of Seoul. The train station at Suwon has a nice model of the fortress so I knew what to expect. I jumped on a bus and disembarked at the south gate which is now a traffic island and being restored. From here it was a surprisingly steep climb up for a few minutes, but by the time I had made my way to the top I was back in the bright sunshine and could really start to appreciate the impressive fortifications winding along the top of the hill. I really enjoyed this stretch of the walls. At one of the many pavilions on the walk I bumped into a group of school children who were learning English. They taught me about the history of the fort which was really nice and I found out their teacher was from just down the road from me when I lived in Dublin. I carried on walking around the whole loop of the ramparts, enjoying the magnificent weather and taking an inordinate amount of pictures. The northern end of town offered some lovely pavilions and gates, so was very photogenic. The eastern side mostly looked out across the suburbs taking in the huge cathedral like Suwon First Church. I completed my lap and headed off into the local shops in search of something tasty to eat, and this being Korea, my options were plentiful and confusingly so were a large amount of shops selling second hand clothing. It took me about 2.5 hours to do a lap, but if your time is limited I would recommend getting a bus to the Northern gate then heading to the Banghwasuryujeong Pavilion (Fredrick's picture below) before back tracking for the more strenuous hike along the western parts of the wall as I found those bits the most interesting. This was perhaps the most enjoyable WHS visit I had in Korea, mostly thanks to the wonderful weather and the chance to get in a bit of a hike, but also the fortification is pretty impressive and a worthy WHS. My visit to Hwaseong happened to coincide with the Hwaseong Festival in October. As a result I was rewarded with seeing the spectacular buildings of the Haenggung adorned with people dressed in traditional costumes and performing traditional rituals. To avoid a longish walk I took either buses 11, 13, 36 or 39 from the station to and from the fortress. Besides the metro, there are faster mainline trains from Seoul to Suwon. Hwaseong is one of the best preserved fortifications in Korea. 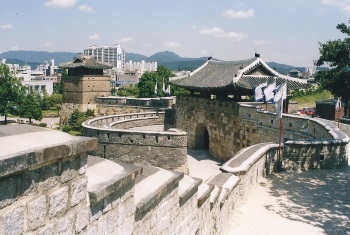 The walls surround the city center of Suwon. There are countless fortresses in Korea, many spectacular, but if you only have time for one, make sure that it is this one or perhaps Namhansanseong. I walked the entire wall, its a fun couple of hours, nice views, interesting stops along the way, and a fair bit of excercise. The fortress is also conveniently only a long subway ride from Seoul. Hwaseong Fortress, the place I fell in love with. If you want to experience what this World Heritage Site has to offer, you have to stay there for at least two days and one night (I keep coming back there for three consecutive days and two consecutive nights). Experience all the performances from 24 Martial Arts performance to Security Guard Ceremony (happens from Tueday-Sunday all year round). Also, walking around the walls from inside the fortress and then outside, daylight and nighttime, is a must. To go inside the palace, it only takes KW1,500. Hotels around the fortress is about KW40,000/night. Just approximately one hour by metro system from Seoul is Suwon, at first sight this is another typical modern Korean city with big railway station, lots of high rise apartments and wide avenues; it seem to be no reason to visit this place, but until you reach the city center to discover the amazing city wall and fortress of Hwaseong. Hwaseong was built in 18th century to protect the new city and royal mausoleums with special technique and design influenced by China and Europe making it one of the first civil engineering in Asia to be constructed under the concept of east meet west. Hwaseong was once a circular city wall, but sadly after wars and public neglect, the southern part of city wall was completely demolished, except the city gate of Paldalmun, and is now look liked a big horseshoe protecting the city center. From my observation, most of tourists start their visit from Paldalmun, the southern gate, and hike up to the peak of Mount Paldalsan for city view resulting exhausting experience and have to unexpectedly end their wall walk, I highly recommended skipping the Mount Paldalsan part and start your trip from the photogenic western gate of Hwaseomun and walk along the wall passing Janggamun, the northern gate, and the beautiful and unique Hwahongmun which has small stream pass under until you reach the pretty Banghwasuryujeong Pavilion and its beautiful park. The city of Suwon was also nice with many good tourist attractions and restaurants; Suwon is also famous for its galbi or Korean barbeque. All in all I really enjoyed my trip to Suwon and Hwaseong Fortress and hope everyone who visit South Korea should visit this city and its small Great Wall of Korea. Actually, it is a circular wall with 4 large towers at 4 directions. This is a little Great Wall in Hwasong. I have walked half of the city walls. I enjoyed the view to the city so much at the top of the hill in the west parts of the walls. Fusion: "The Hwaseong Fortress represents the pinnacle of 18th century military architecture, incorporating the best of that from Europe and from the Far East." On Passports: Inside of passport (last page, right side) shows Hwaseong Fortress. Interestingly the fortress covers the passport security device.